bottom row, WKK/Midnight Daisy, PE/Asters, LZ/Daisy Jane. This charming Chicken Box is a memory from my childhood. My grandmother and aunts all had a chicken on the table with an odd assortment of items in it. It could be a lone button, a broken shoe string, needles, pins and other oddities, or candy! When the chicken is not sitting on her nest, you can use the bowl for serving vegetables, fruit, nuts and candies. 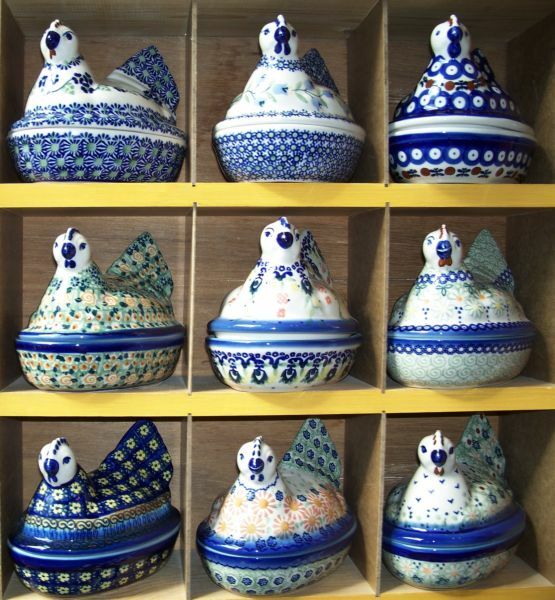 Like all of Renditions Polish Pottery, the Box Chicken can be used in the microwave, oven and dishwasher. You can bake your favorite side dish in the Box Chicken, serve in it, store the leftovers, and reheat them, too, all in the same dish. Now that saves on dishwashing! Box Chicken - AS38 Oh!